"How To Quickly and Easily Master CNC Programming - Starting from Scratch..."
In today's CNC industry environment - there's a serious lack of efficient and experienced people who know how to truly utilize CNC machines to their maximum potential. Fact is there's an ever growing number of skilled machinists jobs requiring serious CNC Programming knowledge. And employers are willing to pay above-average wages to these people. Quite simply because demand of skilled CNC programmers is high. It�s an industry that moves along enthusiastically fast; the technology changes quickly and often in great leaps. All our courses are based on over 17 years of working in just about every known area related to CNC programming. So you're guaranteed to learn it almost effortlessly and most of all quickly. Hundreds of beginners, students, machinists and machine operators have attended and purchased CNC Programming Courses to upgrade and fine-tune their skills. And to discover a new career, enter an exciting university program and pursue their passion. And since you're reading up to this point, I know that you too want to pursue CNC programming as your career. At least for it's high-demand and great pay. Anyway, while most people have never heard of this term, CNC plays a crucial role in manufacturing process one way or another. If you'll be working in engineering or manufacturing companies, it's most likely that you'll be working with CNC on a regular basis. AND IT'S AN EXCELLENT OPPORTUNITY! That's why CNC-Academy.com was created. To supply people like you, with the credentials you need to be a success. But of course also to get a promotion over your competitors, gain more financial security, and move ahead at full throttle! But which course is right for me? Firstly: depending on your EXISTING experience with CNC machines - you can easily go over our courses page and decide which fits your level. We recommend (whether you're a total beginner who's never touched a CNC machine in your life, or a super-experienced one) to look at our BEST-SELLING course entitled "CNC Secrets Revealed". Unable to find skillful CNC personnel, many companies will hire inexperienced people to run CNC machine. With very poor training or no training at all, these companies expect their new people to run CNC machine successfully. If you find yourself in similar position, we recommend that you begin by taking our: CNC Turning Center programming, Setup & Operation Course, or: CNC Machining Center Programming, Setup & Operation Course - whichever Course matches the machine type you're currently running. 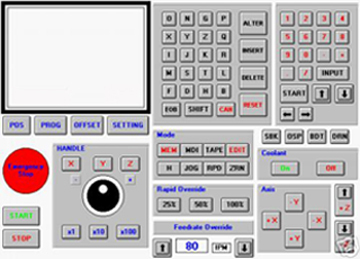 Browse over our website as you'll find many useful CNC programming tips and tricks. And go over our courses page to order a course that could easily double your current income or get you to the top position in CNC programming -- faster then you ever thought possible! Don't just think about it! Make it happen! 6. CNC PROGRAMMING "FANUC METHOD"
SIEMENS CNC Prog, & control. CENTROID T - CNC Progr. & Operat. I must say at the beginning it looked like too complicated for me (very detailed). However as I started all the way from the beginning and progressed to each chapter the instructions how to create a CNC Program efficiently made unbelievable, and complete sense. You take us from baby steps and build our skills to a mega-advanced programmer"
"This is exellent an... I will reccomend you to my collegues. I love your step by step introduction in CNC Programming training. Man, this thing's getting better and better as I learn more about how CNC works, and ways you create CNC Programs." I use it as reference guide whenever I stack..."
As you know, we're in an ever-changing "Information age" which grows exponentially by the minute. So it's just impossible for you to keep up. That's why you need someone who's doing all the "keeping-up" for you, including the research. And brings forth the best information to you. And CNC-Academy is proudly the answer to an affordable way to achieve your goals with ZERO-RISK, lower costs and shorter time to develop your required CNC skills. 1. Do you or your employees need training in CNC programming, setting up and/or operating? 2. Do you need help with CNC programming and machining? 3. Are you new to CNC - have a new machine and need some help getting production started? 4. And have you bought your first CNC machine (CNC lathe, CNC Machining Center or CNC Drilling Center)... and want to learn how to use it efficiently? You'll receive your CNC Courses on CD in Adobe Acrobat PDF format. Students will be able to quickly and easily print any of the lessons, projects, exercises, and references from the courses. Copyright CNC Academy© All rights reserved.